Good news today for Irish consumers, workers and pensioners: Irish prices fell last month (pdf) for the first time since 1960. This is as good an increase in incomes - your money now goes further. Unfortunately the good news is not evenly distributed. In fact, practically all services provided by the state - education, health, public transport - continue to see very strong (5-6%) inflation, with the private sector accounting for most of the fall (including food, clothing, fuel and communications). I'm sure it's just a coincidence mind. “Bad” deflation happens when demand shrinks; “good” deflation happens when supply expands. Between the October 1929 stock market crash and FDR’s inauguration in March 1933, the general price level fell 25 percent, while wholesale prices fell a whopping 37 percent. As prices dropped, so did employment: by the time prices reached bottom around March 1933, a quarter of the U.S. labor force was out of work. Nor did falling prices help the economy to right itself. 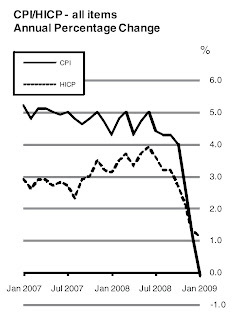 Instead, the deflation only seemed to make things worse, in part by increasing the burden of debt. The lower prices went, the more the real value of every dollar owed went up. Defaults piled up, causing more banks to fail, making credit even scarcer, which meant that there was even less money around, so prices had to fall further. Economists call this a debt-deflation spiral, and they agree that it’s the last thing an economy needs. So which type of deflation are we witnessing at the moment in Ireland? My guess is that it is a mixture of the two: 'bad deflation' in the housing sector and motor trade (think second hand car prices); good deflation in clothing and electronics sectors (which I have commented on before). Then again, if you are in the market for a house or second hand car falling prices seem like a 'good thing'. Expect to see more deflation headlines over the rest of this year, especially as last year's boom and bust in oil prices works through the indices. And pray we don't see the emergence of a debt-deflation spiral: we might even be grateful for a spot of public sector inflation to head that one off at the pass.